Joseph Brech, 55, was arrested near Barcelona Sunday over the murder of eleven-year-old Nicky Verstappen who vanished two decades ago on 9 August at a summer camp in southern Limburg province, near the German border. Brech had worked at the camp at the time. Verstappen’s body was found a day after his disappearance close to the camp site, with authorities later confirming he had been sexually abused before his death. 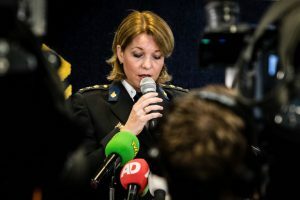 Police at the time mounted a massive search closely followed by Dutch media and the public, but the killer remained on the lose – until advanced DNA testing earlier this year led officers to Brech. Spanish police on Monday escorted the suspect to a tribunal in the city of Granollers where he will be interviewed by video conference by judges from Madrid’s High Court, which decides on extradition requests, a spokeswoman for Catalonia’s High Court of Justice told AFP. ‘The family is very relieved. Justice will be done!’ Dutch journalist Peter R. de Vries, spokesman for the dead boy’s family, tweeted on Sunday. Brech was arrested ‘thanks to a witness who recognised him after seeing his picture in the media in recent days’, according to a Dutch police statement issued late Sunday. The suspect was detained on Sunday afternoon in a mountainous area near the town of Castelltercol some 50 km (30 miles) from Barcelona while he was going out to cut wood, Spanish police said in a statement on Monday. He had extensive survival gear at the time of his arrest, including fishing rods, a book on eatable wild plants, batteries and dehydrated foods. His arrest came after police earlier this year appealed to more than 20,000 men to donate DNA samples in a bid to close in on the perpetrator. Police said new digital techniques helped them to develop a DNA profile in 2008, from traces found on Verstappen’s clothing, but there had been no match. Brech, a former scout worker who was 35 at the time of the murder, was not among the volunteers but as he was previously interviewed as a witness, police became suspicious. When his family reported him as missing in April, Dutch and French police searched his cabin in the France’s mountainous eastern Vosges region, where he owns a chalet and where they found traces of DNA on his personal belongings. A European-wide warrant for Brech’s arrest was issued on June 12.